Though I've already covered alternate paths when I detailed the different types of level design, there are many interesting extensions to designing alternate paths that are worthy of special attention. Depending on the implementation of alternate paths, the overall design of a level can function more like an accordion, origami, or pure organic level. But one of the most interesting outcomes of well designed alternate paths is sequence breaking especially in the context of speed running. Let's take this one step at time. Alternate paths in linear games like the 2D Mario platformers or racing games (short cuts) are the most basic use. Whether you go down pipes to skip parts of the level, take ramps to jump over obstacles, or break bricks to run along the top of the screen (see above), such alternate paths generally offer some variety in what would otherwise be a fairly linear progression. But don't be fooled. Just because a game offers multiple paths doesn't mean it also offers any more gameplay variety. It's possible to create an alternate path that plays the same as the original path and fails to offer any kind of short cut or bonus of any kind. If this happens, then the function of the alternate path detracts from the overall level due to the added clutter. The frequency of alternate paths should be kept low and balanced against the main path. In order to maintain the idea of a core path and alternate paths, you have to make sure the core path is the most obvious and/or the most used path. Just think of the madness that would ensue if every pipe in Super Mario Brothers warped you to somewhere else forward, backward, or even to another level. The alternate path should be out of the way or concealed in some manner. This simply means players should have to skillfully access an alternate path. (Remember that skill is based on 5 types. Knowledge, Timing, Reflex, Dexterity, and Adaptation). The player should be able to orient the alternate path to the main path. An alternate path shouldn't completely remove the player from the main path as if teleporting the player into a completely new level/game. The player should be able to orient him/herself to the main path. Being able to do this will help the player realize how the paths are connected and share the same space, which reinforces the concept of an alternate path. Many games provide maps so that players can orient themselves when necessary. Alternate paths for linear levels are evaluated just like normal sections of the level with a few additions. You must also consider how the player accesses the alternate path and how, if at all, the path connects back to the main/other paths. 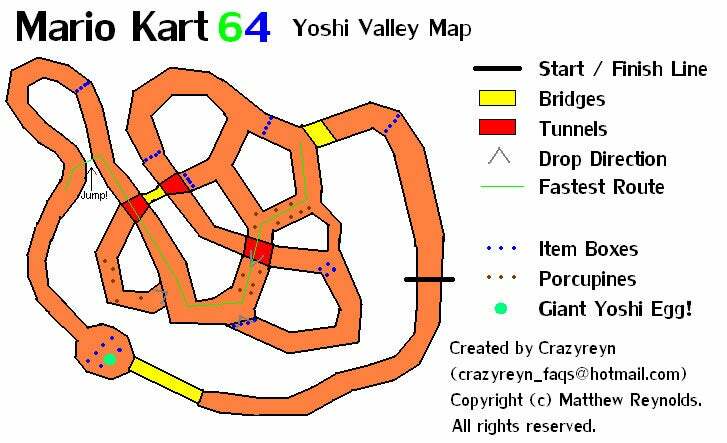 Yoshi's Valley from Mario Kart 64 is all about alternate paths. Here's a map and a video. Just try and make sense of who's in first. The game can't even tell until the end. Another classic example of alternate paths is one of the greatest secrets in Super Mario Bros. 3. Aside from the branching paths, locked gates, and warp pipes built into the overworld (see above), SMB3 takes jumping paths to a new level. Just watch the first 2 minutes or so if this speed run and you'll see what I mean. When a game is designed with levels where players can progress in all directions instead of just left to right or around the track, even when going from point A to point B, the possible paths open up greatly. The bigger the level, the more opportunities there are to connect sections of the level in unique ways. This is especially true for LittleBigPlanet. Let's look at Improvisation #1. Start at the bottom left and trace the RED line to the top of the level. This line represents the main path I designed for players to take. This path is the most forgiving and/or requires the least amount of advanced platforming techniques. Notice how the path generally moves form left to right. Though the LBP engine is free to create levels that progress in any direction, because Westerns read from left to right there's something familiar and comforting about designing at least some part of a level with this trend. Next look at the ORANGE lines. These are alternate paths that can take players all over the map. With the advanced technique of MOMENTUM JUMPing, players can use the center piece of the level to access the majority of the areas. When doing so, it's clear to the player that they're branching off from the main path because of how much space they have to cover to reach the new areas. On the main path, the connected areas are always positioned closely to each other. Also, the camera is tilted in these alternate areas to point the player back to the main path. Notice how most of the alternate paths are anchored to the center piece of the level. This design decision makes it easier for the player to make a mental map of the level. The YELLOW paths are designed to help the player bridge areas of the level and strengthen their mental map. I designed the camera to accommodate the player traveling along the main (RED) path first. Naturally when traveling through alternate routes, the camera positions may obscure nearby areas. By taking the yellow paths, the final pieces of the big picture should come together for the player. Not only is the PURPLE path is the most open ended, non linear path in the level, but it's the most advanced requiring a high level of skill and mastery of the whole level to navigate successfully. The area at the top right of the level emits 2 different kinds of floaters. One is large allowing the player to float up to the top and beat the level. The smaller floater serves a more complex purpose. This small floater doesn't have enough lift power to fly with a Sackperson holding on tight. So instead of flying, player slowly fall when holding on. Because the floater is emitted into the foremost layer, it only interacts with a few other objects in the level including the rotating piece in the middle. This design allows players to "fall with style" and access difficult to reach parts of the map by being knocked around by the center piece. Also, because the emitter can be aimed in all directions, players can create their own way to go. There are still additional paths for Improvisation #1 that I didn't map out. The momentum jump and the 3 lane 3D design of LBP really go a long way for designing alternate paths. I designed Improvisation #1 to have a dynamic center piece that will allows the player to stumble onto many difference paths and therefore musical directions before reaching their end goal. In this way, I harmonized the alternate paths of the level design with the core gimmick/theme; improvisation. Next time, I'll cover what is perhpas the ultimate form of alternate paths... sequence breaking. I used to play this game at my child hood and i m an addict to this game and after reading your blog i had called to my old friends after more than a decade thanks for this great article. I just found a (presumably) new glitch in the game that could be beneficial to all those who wish to have ladders in their levels. If you place two vertical columns of any material about two small grid spaces apart, you can climb between them by repeatedly pressing the X button. The one catch is that getting onto the ladder is tricky; if you're standing on the ground between the columns, it won't work. If you jump between the columns from a platform behind the columns it will allow you to climb, but you'll soon be forced back onto the platform you started on. You'll have to use some outside-the-box solutions to get onto the ladder. The width of the columns is irrelevant, and the spacing doesn't have to be exact (so far the aforementioned spacing has yielded the best results for me). You can fall freely between them, but rapidly pressing X will allow you to ascend. Add rungs in the thin layer in front of or behind the columns and you have an aesthetically-accurate working ladder. Nice colouring of these pictures. Thanks for share this. That one kept me busy thinking about ways to reward players in a game ... I hope you'll enjoy the outcome.